Steel is one of the most used metals in different industrial as well as home improvement applications and is available in various shapes, specifications, grades and finishes. However, when it comes to one key differentiation among steel products, it is hot rolled vs cold rolled steel. The question is: why we need to know about the difference between hot rolled steel and cold rolled steel? It is obvious that different applications require different types of steel and if you have the necessary information, it might help you to save your time and money on additional processing. For engineers and fabricators, it will help to get superior outcomes at best price. As the names suggest, it is all about processes. The processes differentiate hot rolled and cold rolled steel. Hot rolling is a process that is done with heat and cold rolling is a process that is done at room temperature. Here, we will understand both types of steel in detail. The main motive to go for hot rolling is to make steel easy to form and easier to work with. Here, the steel is roll-pressed at high temperature, sometimes over 1,700 F.
The hot rolling process is simple and it starts with a large billet that is rectangular billet. The billet is sent for pre-processing once it is heated and it is converted into a big roll. To get highly accurate finished dimensions, the white-hot steel is run through a series of compression rollers. Once the process is over, the hot rolled steel is cooled down and hence, a fabricator has limited control over its final shape. In applications where high precision is required, hot rolled steel is less preferred. 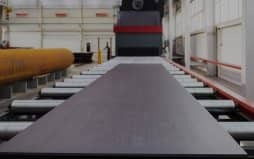 It is actually hot rolled steel with further processing and to get this, fabricators use cooled-down hot rolled steel and further roll it to get highly precise and exact dimensions and superior surface qualities. Cold rolled steel has more finished surface and has tighter tolerances. If you find a smooth surfaces with an oily touch, it is cold rolled steel in your hands. It has well-defined edges and corners. As cold rolled steel has better finishes and surfaces, there is no doubt that it is highly preferred where aesthetics are important, such as home improvement products. However, there is a drawback and that is the price. Cold rolled steel is expensive than hot rolled steel due to additional processing. In addition to that, the cold rolling process might also cause internal stresses. It is your metal fabricator who will decide which type of steel is perfect for your application. MetalsCut4U.com is a renowned name when you are looking for highly accurate metal fabrication services for your home improvement or other domestic fabrication needs. Contact them with your specifications and they will do the rest.